Locking T-Nuts have a lock or thread interference formed by indentations on barrel near flange. Load torque will depend on bolt hardness and the number of threads turned through the lock. An alloy or hardened bolt can distort the crimp lock and reduce load torque. 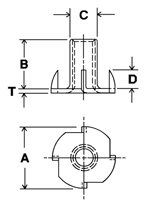 Ideal loads would have the bolt engaged to the depth of the flange.